With less than a month left, 2018 is wrapping up. It’s time you and your green industry business starts looking towards next year and what may come of it. To help you prepare for what 2019 might bring, here are a handful of trends that will either emerge or continue to grow. From the money-making of Facebook to the rise of Instagram pretty much every person you know and business you buy from is on one or more social media platforms. According to The Manifest, 92% of small businesses invested more time and money in at least one social platform in 2018. This isn’t a real surprise to anyone, it’s another way businesses can engage and build their audience in hopes of growing their customer base. And with the addition of new advertising tools and features it’s becoming easier and easier to target exactly who you want. That’s exactly what makes it valuable to green industry and field service business; the ability to geo-target potential customers in your area. Facebook Reviews: Additionally, as an onslaught of ads continue to be thrown at people everywhere they look - from computer screens to billboards - the level of they trust what they see and hear will continue to descend. People have the need to vet potential services and one area they tend to look is a business’s Facebook page. But this doesn’t mean you should be deleting bad reviews, rather handling them correctly and transparently will show how you value your customers’ experiences. People are inherently curious and the majority of your best customers do their research. So it’s no surprise that, according to HubSpot, the best source of high-quality leads are captured from content marketing. Multimedia content is the best - and most time consuming - approach. The way people prefer to consume information varies, some enjoying reading a blog other would rather watch a video. So it’s a good idea to test which one gets the best response from your audience. 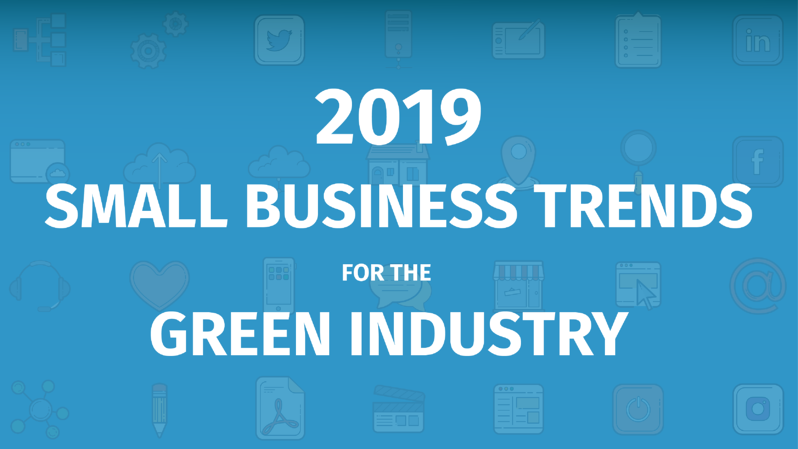 We already talked about it before but the ability to target the right audience is one of the most effective ways to build a customer base for green industry business. This will only continue to become more and more useful as more people adopt technology to find services. In the past year 242 million people accessed location-based services on their mobile devices, up from 220 million in the previous year. 2019 is the year small businesses begin taking advantage of cloud technologies if they haven’t done so already. Here, at HindSite Software, we developed our own cloud platform. With FieldCentral, we created a software that’s not tied to a server so you can access it anywhere you bring your device. The cloud gives your business the opportunity to use powerful technology without the initial investment for computing infrastructure. Whether it’s our’s or another software, your business should be researching how cloud computing can boost your bottom line. When it comes to marketing there’s no stopping the automation and technology train. It’s already left the station and will only pick up speed. From helping you scale your marketing to saving time and money there’s plenty of reasons your business should be using automation. As businesses continue to employ all theses marketing technologies, it’ll be crucial to explore how you can do so without losing the voice and personality that makes their business unique. The founder and CEO of Maven & Moguls, Paige Arnof-Fenn says, “Technology runs our lives more than ever, but it is relationships that drive business and commerce, so people will find more ways to connect in person to build trust and strengthen connections. Make sure you offer several ways to talk with [customers] and get to know them. Algorithms can only tell you so much about a customer, [but] transactions are driven by relationships. Use automation where you can, but do not ignore the power of the personal touch."